Cellists Mikala Schmitz and Avery Waite spent part of their final conservatory year doing something that most musicians can only dream about: studying with and performing alongside renowned cellist Alisa Weilerstein. The two were selected, following a competitive audition process, as Cleveland Orchestra Artist-in-Residence Fellows for the 2009-2010 season. Three fellows in all were chosen, and Oberlin students have won the orchestra’s prestigious honor two years running. 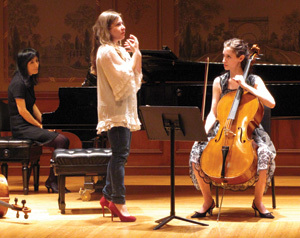 Weilerstein, the orchestra’s artist-in-residence, worked with the young fellows for a week in November; Schmitz and Waite participated in private lessons with her and performed in a public master class held at Severance Hall. In addition to coachings with Weilerstein, the fellows had the chance to observe firsthand the work that goes into preparing a concert with a world-class orchestra. Throughout the week, they were invited to sit in on closed rehearsals of Dvorák’s cello concerto, which Weilerstein performed with the orchestra to rave reviews. The Stulberg International String Competition is among the most distinguished of contests for young musicians; past winners include violinist Joshua Bell. Ran Cheng ’11 of Beijing won a silver medal in the 2009 contest—the only violinist to capture a top prize. A student of Professor of Violin Marilyn McDonald, her winning turn was the allegro movement from Sergei Prokofiev’s Concerto No. 2 in G minor, Op. 63, and the sarabanda and giga from J.S. Bach’s Partita No. 2 in D minor. 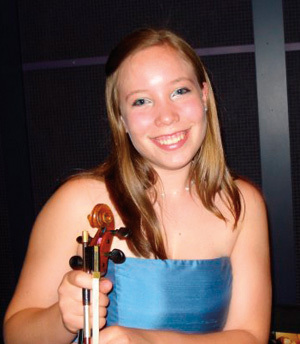 McKenzie Bauer, of Boise, Idaho, tied for first place in the college division of the Washington-Idaho Symphony Competition, held in December 2009. “It always feels wonderful to place first in any competition,” says Bauer. “I played to the best of my ability at the audition, which makes the result even more satisfying.” The following month, Bauer reprised her winning performance, the finale of Saint-Saëns’s Violin Concerto No. 3 in B Minor, with the symphony at Lewiston High School in Lewiston, Idaho, in a program that featured the competition winners. Holly Jenkins, of House Springs, Montana, won first place in the Lennox Young Artists Competition, hosted by the Richardson Symphony of Richardson, Texas, and held at the University of Texas in January 2009. She performed a movement from Tchaikovsky’s Violin Concerto in D Major, Op. 35. In addition to a $1,000 cash prize, Jenkins presented the complete violin concerto with the Richardson Symphony in March 2009, under the baton of conductor Anshel Brusilow. “Jenkins is a huge talent. She played with silken tone, dazzling technique, and natural expressivity,” wrote the Dallas Morning News. Violists also brought awards home to Oberlin. Meredith Crawford ’10, a student of Professor of Viola Peter Slowik, won first prize for her performance of the first movement from Miklos Rosza’s Viola Concerto at the Skokie Valley Symphony Concerto Competition, held in April 2009. Other Obies to have won at Skokie include violinists Amy Oshiro ’95 and Jennifer Koh ’97. Slowik students are tough acts to follow. In 2009, violist Allison Lint ’10 won first prize in the 2009 Ohio Viola Society (OVS) Solo Competition, playing Max Reger’s Suite in G Minor and William Walton’s Viola Concerto. That was the third year in a row that a Slowik student won the OVS competition. Not wishing to break the streak, viola performance major Dillard Cheek ’12 won first prize for 2010, performing Bloch’s Suite for Viola and the Bach Chaconne. Shelly (Xiao) Du ’11, a harp performance major from Oklahoma City, won first prize and a $2,000 scholarship at the Anne Adams Competition of the American Harp Society, held in June 2008 in Dearborn, Michigan. She played Fantasie on a Theme of Haydn by Marcel Grandjany, Sarabande et Toccata by Nino Rota; and the harp cadenza from Maurice Ravel’s Tzigane. She studies with Assistant Professor of Harp Yolanda Kondonassis. 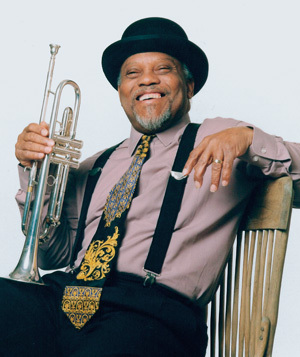 Visiting Professor of Jazz Trumpet Marcus Belgrave, called the “patriarch of Detroit jazz,” was honored in October 2009 with the Kresge Foundation’s Eminent Artist prize. The $50,000 award acknowledges Belgrave’s lifelong dual careers as performer and teacher, and his profound influence on the musical life of his adopted hometown. Detroit has been very good to its adopted son. In 2008, a testimonial resolution by the Detroit City Council honored Belgrave as “Jazz Master Laureate” of the city. The resolution cites Belgrave’s work as a trumpeter, composer, arranger, recording artist, and producer, including such career highlights as his early performance years with Ray Charles and recordings with, among others, Max Roach, Charles Mingus, and Eric Dolphy; his session work as one of Motown Records’ “Funk Brothers;” and his appellation as the first jazz chair of the Detroit Symphony Orchestra. Professor of Musicology Steven Plank received the Thomas Binkley Award for 2009, honoring his outstanding achievements in performance and scholarship as director of Oberlin’s Collegium Musicum. The award was presented to him at a special ceremony during the annual meeting of Early Music America, held at the Boston Early Music Festival in June 2009. The Oberlin Collegium Musicum is an auditioned ensemble comprised of a choir and smaller vocal ensembles, with a special focus on 16th-century liturgical polyphony. Forays into the repertory outside the 16th-century include Bach motets and cantatas on the one hand, and Notre Dame polyphony on the other. The Collegium presents regular standing room only concerts in Fairchild Chapel, and tours frequently. The readers of DownBeat magazine had their say. Grammy winner Robin Eubanks, associate professor of jazz trombone, was the number one jazz trombone player for 2009, the 74th year that the magazine has been polling its readers. They cast their opinions in categories that included individual artists, jazz groups, and recordings. There were 12 trombonists in Eubanks’ category, artists such as Slide Hampton and Delfeayo Marsalis among them. Eubanks has won the magazine’s international critics’ poll five times, but this is his first award from the readers, which, he says, makes the honor particularly sweet. “I want to thank DownBeat’s readers for the acknowledgement, and I hope to see and meet them as I travel and tour,” he says. More information can be found on the Oberlin website and at www.robin eubanks.com, where fans can sign up for Eubanks’ newsletter and podcasts. Fulbrights were awarded in 2008-09 to Glenn Stroh ’09, Jennifer Torrence ’09, Nathaniel Cox ’09, and Clio Tilton ’07. 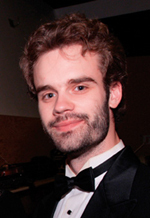 The Fulbright allowed Stroh, who earned a Bachelor of Music degree in organ performance as well as a Master of Music degree in historical performance, to fulfill his dream of studying at the Hochschule für Musik Franz Liszt in Weimar, Germany. He recently completed post-graduate performance study with a focus on German Romantic repertory, performing on important historic instruments throughout the country and researching 19th-century instrument-building traditions. Jennifer Torrence ’09, who earned a Bachelor of Music degree in percussion, earned a Master of Music degree from London’s Guildhall School of Music and Drama with the help of her Fulbright. She studied contemporary British music for percussion solo and piano-percussion duo and worked one-on-one with Sir Harrison Birtwistle, Richard Barrett, and Jonathan Harvey. 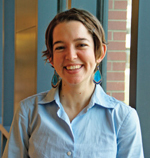 She also commissioned three emerging composers—Matt Rogers, David Ibbett, and Sasha Siem. Nathaniel Cox ’09 earned double-degrees in trumpet performance and Russian. With his Fulbright, he entered the three-year master’s program in cornetto performance at the Schola Cantorum Basiliensis in Basel, Switzerland, where he is studying with Bruce Dickey. Cox hopes to pursue a career as a professional cornetto player in Europe upon completing his degree. Violinist Clio Tilton ’07 completed her Fulbright year in spring 2010 following studies with Gilad Karni at the Conservatoire de Lausanne, doing a master’s program in orchestral playing. Next year she will remain in Switzerland and finish the degree while taking lessons in baroque violin and viola, concurrently, with Florence Malgoire at the Conservatoire de Genève. She says she first experienced the power of music to alter the lives of at-risk youth in a Nicaraguan community center. Three teams of conservatory students spent the 2009 winter term pursuing projects funded by Oberlin’s Creativity & Leadership project. C&L’s Conservatory Initiative Grants Supporting Imagination and Excellence (CIGSIEs) single out a few particularly entrepreneurial student projects and provide the resources to help their creators put them into practice. Guitarist Tim Ballard ’10 and saxophonist Andrew Flachs ’10 also hit the road, undertaking a two-week concert tour of community centers and universities in Ohio, Pennsylvania, New York, and North Carolina. As the Syzygy Duo, the two performed mostly contemporary works, including some written by fellow Oberlin students expressly for their novel instrumentation. The tour proved to be “a defining moment in our musical careers,” they wrote. “The experience gave us a crash course in the lives of professional musicians and the opportunity to network with faculty and alumni up and down the East Coast. Only Oberlin could provide a relatively untested guitar and saxophone duo with this incredible opportunity.” In an effort to remain carbon neutral and educate audiences about environmental stewardship, the duo, whose member Tim is also majoring in environmental studies, purchased carbon offsets for their journey and printed program notes on recycled paper.